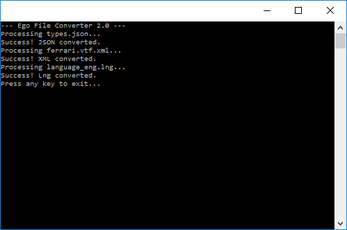 Drag/Drop a supported file on Ego File Converter.exe. Drag and drop a file on the exe to convert it. Alternatively, you can right click a file, click "Open With", and choose the exe. The files don't have to have the proper extension to be converted. The program will auto-detect the file type by reading into the file. Note: After conversion, the output file will overwrite any existing file. Output file names are the input file + ".xml", ".json", ".lng", or ".pkg"